The document below has a numbered blue "comment dot" ( ) at the beginning of selected items. Click a blue dot to add your comment regarding that item. A glasses icon ( ) indicates existing comments on an item; click it to see them. Click the buttons above to navigate between views. 1 Publishing business models assume costly production and distribution, and expect a few hits to fund the misses. Going digital changes this. 2 Perfect digital copies make distribution cheap; digital editing and recording tools make production cheaper too. It is easier than ever to create and give away work, and Creative Commons will help you do that. 3 Getting heard and getting credit are great, but wouldn't you like to get paid too? mediAgora defines a fair, workable market model that works with the new realities of digital media, instead of fighting them. 4 mediAgora defines a new market model, based on coherent principles and goals. 5 Creators should be credited and rewarded for their work. 6 Works can be incorporated into new creative works. 7 When they are, all source works should be credited and rewarded. 8 Customers should pay a known price. 9 Successful promotion of work should be rewarded too. 19 A Work is a creation that can stand alone, embodied in digital form. It may be a song, a poem, a novel, a photograph, a video sequence, a computer program, a learned article or a combination of any of these. 20 It may have sprung fully formed from the mind of the creator, but in many cases it will be based on Source Works and will refer to these explicitly. 21 The work will have a list of Creators associated with it, and their relative contributions. 22 A work will have a price, set by the creators. This will include the prices of any source works. 23 When a Customer pays the price and receives a copy of the work, it is divided between the creators in the defined percentages, and the prices for the source works are similarly divided. 24 While this can fulfil the 'getting credit' and 'getting paid' aspects, getting heard is still a problem - as works are abundant, easily created and easily copied, the competition for the customers' attention becomes more important. 25 This is where Promoters come in. They are paid by the creators for sales. A promotional fee is fixed as part of the price charged for each work. If I buy the work from the original artist, they earn this fee. If I buy it through a promoter, he earns part of the fee. If I tell a friend to buy it, I receive a part, the promoter I bought it from also receives part of the fee and the original artist keeps the remainder. Whoever the customer hears about the work from, she pays the same fee. 26 Each person adding value and creating a new work can specify their fee and promotional fee, so there is competition at that level between works, but they can't reduce the fee or promotional budget of their source works (except by subsidizing it themselves). 27 As well as specifying this fee, the creator specifies a sales target and accounting period. At the end of the accounting period, the promotion fees are distributed by the ratio of the number of actual sales achieved by each promoter and his downstream promoters divided by the sales target, and passed down the line. 28 A small percentage of each purchase is also paid to the operator of the marketplace. 29 You are the creator of a digital work, and you want to get credit for your creation, and to get paid by those who enjoy it. Your first reaction to the idea of perfect digital copies being rapidly made is likely to be one of fear that people will copy your work without paying you. Your second reaction will be to try to find a way to prevent this copying through some kind of clever locking technology. This is a big mistake, because the problem is not solvable. Anyone who can view your content can copy it. 30 When you buy a piece of music, a book, or a movie, you expect to be able to play or read it at your own convenience, when you want to. You might not read all of it at once; you may re-read it, or listen to it over and over again. The reason you bought it was to have this kind of flexibility. Copying and editing are a natural extension of this kind of partial or repeated viewing. Digital media make this an easy and natural thing to do, and something that your customers both expect and value. 31 These kinds of copies are not foregone sales; in fact by excerpting and quoting your work they are likely to lead to more sales. The kind of copies you need to worry about are those that involve your work being republished. 32 Publishing your work via mediAgora implicitly allows others to edit it and incorporate it or part of it in their derivative works. However, if they do so, they need to include a reference to your work as a source work and require that any customers that purchase their work buy yours too. 33 Similarly, customers may tell their friends about your work, or incorporate it in playlists or collections they share. In this case they are not creating a new work with added value, but acting as pure promoters. Paying them a little commission for this gives them an incentive to work within the system that pays you, instead of outside it. 34 It is widely quoted that 'Athene sprang fully formed from the head of Zeus', but if you trouble yourself to read the full story, you will find that this happened only because Zeus ate Metis (Athene's mother) whole. 35 You may want to consider dividing your own work up to facilitate this - defining your movie as a playlist of scenes, with separate price and creators for each would give more flexibility for derivative works, and still act to promote your movie by the connection as a source work. Conversely, you could create a composite work from your smaller ones - an album, or other 'bundle deal' where the price of the whole is less than the sum of its parts. 36 The promotional fee choices are yours too - you can make the promotional fee 95% of the sales price to simulate the traditional royalty model, or 50% like a traditional retail distributor, or 10%, like an agent's commission - your call. You can set the sales target low or high, and the accounting period to be a day, a week, a month or a year or anything inbetween. This flexibility should allow you to find a price structure that suits you and your promoters, and that your customers are willing to pay. 37 You like the convenience of getting your music and videos and other works in digital form, and want to be able to enjoy them at your convenience. You know that downloading from unauthorised sites means that the creators don't get paid. Equally, you don't want to pay for annoyingly locked-up media, which assumes you are guilty until you prove your innocence. You might like to remix or re-edit the media you buy. You may even be aware of how little of the purchase price goes to the original creator under standard publishing agreements. 38 With mediAgora, you know that the media you buy will not be locked up, but in a form you can copy and use. You pay once to be able to listen to and edit it however you like. You can even know exactly how much of the purchase price goes to the creators, and how much to promoters. A market is built on trust, and the creators who sell work through mediAgora are trusting you not to pass on or re-sell their work without giving them credit. 39 If you find a work you like through mediAgora, you probably want to share it with your friends. You are encouraged to do this by becoming a promoter - you get paid a promotion fee on any sales resulting form your referrals. 40 If you make a remix or edit, or add you own music, words or video to an existing work, you can publish that too - you register as a creator, and set your price and promotion fee, and this is added onto the fee for the work you started from. 42 The Creators set the price of the work, including the promotion fee, and the sales target for each cycle. If the Promoter meets the sales target by the deadline, he earns the promotion fee in full for every sale. If not, the Creator keeps some of the money. 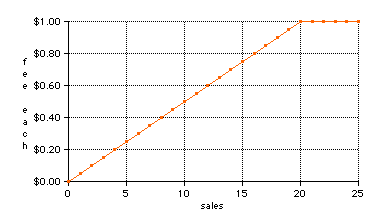 The promotion fee paid when the target isn't met is the ratio of the number of sales to the target, multiplied by the number of sales. 43 In the simplest case with a creator, a promoter and a customer, this is how it works. You could achieve a simple one stage fee by setting the sales target to 1 unit. However, as each customer can become a promoter, we need a way to chain promoters and reward them accordingly, without causing them to compete in destructive ways. 44 The idea is that each promoter is rewarded for the total value of all sales they or their customers make. Any promotion fees earned between them and the ultimate customer are subtracted from this. The reward function is designed to ensure that cutting out upstream promoters gains you nothing. In the other direction, you gain more from a sale you make directly than one your customer makes, but sales your customers make increase the overall reward for your other sales. As the total price is fixed, the customer has no incentive to shop around between the different people in the chain, and as the downline payment is independent of how many are in the upline, there is no incentive to 'cut out the middleman' and distribute straight from the artist either. The artist has a slight incentive to go direct, but if they set the promotional fee at a sensible level they get the bulk of the fee per client anyway, so this effect is diluted. There is an incentive to have a shorter, wider structure rather than longer chain, as the reward from downline redistribution is the difference between your total, and that of the branch, so the rewards go predominantly to those who spread it widest. 45 Andrew makes a movie, and sets his fee to $4, the promotion fee to $1 (so each customer pays $5) and the sales target to 20 for the month. 46 Boris buys a copy and promotes it. He persuades Carol and Christopher to buy a copy each. Carol gets 5 of her friends to buy it, Christopher gets Doc and Dave to buy a copy. 49 Total sales 10. 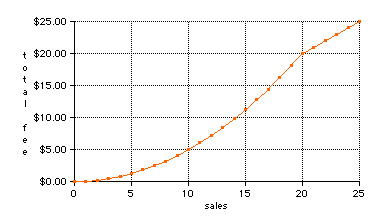 Sales target 20. 50 As root promoter, Boris made all 10 of these, so he gets 10 x 10/20 x$1 = $5. The remaining $5 goes to Andrew. 54 If you hit the sales target, it saturates, which means that the promoter gets the full fee for each sale. If Doc posts a link to the movie on his weblog and 25 people buy it, how does that change things? 55 Total sales 35. 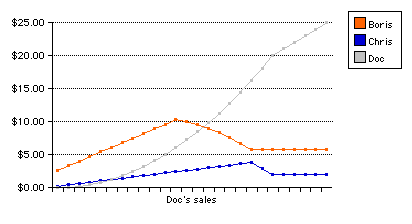 Sales target 20. 58 As root promoter, Boris made all 35 of these, so he get 35*$1 = $35. As the target was hit, Andrew retains no promotion fee. 64 In either case, Andrew would pay his hosting costs and a small percentage service fee per sale. 65 The more astute among you will have noticed that the promoter's reward curve has flattened off here - any further sales Doc makes will net him the full promotion fee, and Christopher and Boris make nothing further from them. In fact, Christopher and Boris would have done better if Doc hadn't hit the target at all, but had caused them to do so instead. 66 This at first looks anomalous, and implies it may give perverse incentives to Boris and Christopher about making sales. In practice, at this point any further sales they make themselves, or through other will be rewarded at the full promotional fee. The way that money moves towards those who make the actual sales target is by design, and the adverse affect on pure middlemen is to encourage them to make sales themselves, or go and create something and sell it. If they lobby Andrew to increase their sales targets next month, in the hope of Doc not meeting them this time, this is a mostly benign effect; as the sales records are public, Andrew is well aware who is making most sales for him. 68 The basic ideas of spontaneous orders, markets as information transmissions, and how trading creates value through voluntary exchange I got through reading inspired by my father. The link above is to a paper of his entitled Two Kinds of Order on the difference between order that is designed and order that is grown. 69 Cluetrain has been described as 'marketing executives that defected to the market'. It explains how the net breaks all the assumptions of the broadcast model, and how markets are conversations. 70 Gonzo Marketing is a free-wheeling rant I couldn't hope to emulate, so I'll just quote a bit: ...nearly all business approaches to the Internet shoot for a mass market. "Let's see, it'll cost us a million-five for the site and another mil for the ad campaign, but think of all the ways we can monetize a billion clicks! We'll hit breakeven inside 90 days. Cool! How soon can we IPO?" Uh-huh. But it ends up costing three times as much -- and no one shows. Meanwhile, some teenager puts up a page of dancing hamsters that pulls eighty-three bajillion hits in two weeks -- so many that her ISP's server melts down. Total cost: twenty-nine dollars. But does business make the correct inference from this? Does anyone in the boardroom say "Jeepers! They'd rather be looking at singing rodents than our zillion-dollar e-commerce site!" Generally speaking, this realization is strenuously deprecated. 71 As well as through these books, Chris Locke, David Weinberger and Doc Searls have all, through many online conversations and provocations, helped me clarify my thinking. 72 Lawrence Lessig's clear and thoughtful books explain how different approaches shape our actions - laws, norms, markets and architecture. One of the many concepts that Lessig explains is the idea of liability vs property - a key part of mediAgora is assigning rights to conform with a uniform liability rather than a per-case negotiation. 73 David Weinberger has written a profound book, discussing the way the net shapes our thoughts and behaviour, and reflects what we bring to it. From it I draw the idea that if you go looking for thieves and pirates you will find them, but if you go looking for honest customers who appreciate your work, you will find them too, and that they are much more interesting to find. 74 Bruce Schneier's follow-up to the authoritative Applied Cryptography explains how encryption isn't a panacea and that what counts is designing your system so it is robust even when people don't behave as you would like. 75 Robert Wright applies game theory to economic, social and evolutionary history in this clear exposition of how non-zero-sum actions (sharing, trading, co-operating) win out over zero-sum ones (hoarding, stealing fighting). 76 Kevin Kelly's book (full text linked above) examines emergent behaviour, and spontaneous orders, and how to create them. Also the essay The Web Runs on Love not Greed is very apposite. 77 This is the book in which Dawkins best explained the 'meme' idea, which underlies a lot of the thinking in the other books above. 78 His thoroughly researched and detailed essays on the History of Communications, Content is not King, Micropayments and the relative growth rates of network infrastructure and local storage all repay further reading. 79 Malcolm Gladwell tells stories of how people connect into networks of association, and how ideas move through these networks. This fits in very well with the Promoters idea of mediAgora. 80 Janis Ian,Courtney Love and many more who haven't spoken out. 81 All those at Gonzo Engaged, Small Pieces, BlogTank and the Cluetrain List, plus of course Doc, David and Chris. Many thanks go to Dorothea for her clear advice and guidance on markup and CSS. 82 Lots of you have listened to me talk about this at huge length over the last year or so, and helped me clarify my thoughts by incisive comments. Particular thanks to Rosie, Cordelia, Peter, Chris, Stuart, Sam and Dean.